When Google feels like our queries are too complex and suspects that they are sent by a robot, it throws a captcha (a squiggly word with a box below it). This supposedly protects Google from being misused by non-humans, i.e. computer programs, that may find and scrape too much information too quickly. If you are a human presented with a captcha, Google recommends to take a few actions. Unfortunately, in practice, this doesn’t help a whole lot. Here is what usually does help, at least makes things easier: cleaning cookies; using a different browser; rebooting your Internet connection; or simply waiting a few minutes. There’s no 100% solution that would stop the Google.com search from questioning our humanity once and forever. Filling out an occasional capture is no big deal. Unfortunately, about 2 or 3 weeks ago, mid-November 2013, the Google capchas’ behavior towards humans has worsened. Not only they appear quickly and often for those of us who use advanced operators like inurl:, the asterisk, and the numrange. It has a new behavior. Filling out a captcha doesn’t let us see the results; instead we are sent back to the empty Google search. Thus any search activity is stalled for a while. These posts: on our LinkedIn group, on Twitter, and on the general Google search forum are just a few reports about this. 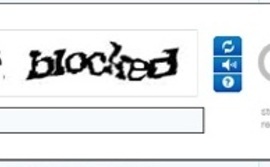 I experienced a captcha attack first-hand while preparing the fun “Boolean Solved” presentation. I have also created just a slightly more complex custom search engine that searches across .com, .org, .edu and many more domains. Use this link: Google No-Captchas or access this CSE in the Search Engine list.